How much telephone engineering did Bell actually do? Did Bell Steal the telephone from Gray? This essay is a review of Bell's role in the invention of the telephone covering both the engineering and patent aspects. I read three books covering this topic, which is pretty much the complete book literature, including a new (2008) book by Seth Shulman ('Telephone Gambit'). It was Shulman's excellent book that triggered my interest in this topic. I also dug around in the primary source material: reading through Bell's 'telephone patent' (#174,465) and looking through his lab notebooks (now online). By a "remarkable coincidence" two inventors, Alexander Graham Bell and Elisha Gray, filed for a patent on the telephone on the same day (Feb 14, 1876). The patent was awarded to Bell because his patent application arrived at the patent office first just a few hours before Gray's. A review of the facts in a new book 'The Telephone Gambit' and in several other books shows that this AT&T story is largely self serving baloney. The real telephone patent story, as opposed to the engineering story, is basically one of crooked lawyers (Bell's) and bribed public (patent) officials combined with incompetent lawyers (Gray's). For from being a coincidence the evidence is overwhelming that Bell's lawyers somehow (maybe from someone in the patent office) got word that Bell's rival Elisha Gray lawyers had just hand delivered a patent caveat to the patent office. So to beat him out, they rushed to the patent office with a Bell's patent application, which they had been sitting on three weeks waiting for it to be filed in England, and demanding that it be special handled and immediately be forwarded to the examiners office, which it was. b) Ruling that the requirement for an operating model was waived in this case. Pretty important as Bell up to this time had never got his telephone to really work, meaning it could transmit sounds, but not intelligible speech. c) Bell's patent was approved by the examiner and the patent issued in the incredibly short time of three weeks! The circumstantial case, as reviewed by the recent Shulman book (Telephone Gambit), is very strong that information about the Gray's confidential caveat, both its content and details of its filing, which were of course known to the examiner, made its way to Bell's lawyers. a ) It helped Bell's lawyers make the case that Bell's application had priority. b) It (very likely) helped Bell to make his first operating telephone. Bell did this just three days after returning from Washington by changing to a new (liquid variable resistance) transmitter design that was nearly identical to what Gray had described in his caveat. c) The examiner may have even have allowed Bell's patent application to have been removed and altered to include material substantially identical to the contents of Gray's caveat. There's no doubt that material similar to the caveat (describing how to build a variable resistance liquid transmitter) was added to Bell application after it had been written, because the original Bell's hand written application survives and its shows this material written vertically in the in the margin. New information that Shulman discovered in 2007 that is a further nail in the case. He found that the sketch that Bell made in his engineering notebook of his first operating telephone transmitter is nearly identical to the sketch Gray had drawn a few weeks earlier for his caveat. I just finished reading a new (2008) book on the invention of the telephone, called the Telephone Gambit (by Seth Shulman), that has brought me up to speed and interested me to know more. So I followed up by reading Everson's (an engineer) 2000 book, "The Telephone Patent Conspiracy of 1897" and Baker's (a patent lawyer) 2000 book, "The Gray Matter, The forgotten story of the telephone." The author of the Telephone Gambit has looked carefully at Bell's lab notebooks, which (only!) after about a century (in 1975) were released by the Bell family and only since 1999 have been readily available, and makes a good case that hanky-panky was involved at the patent office by the lawyers and examiners of Bell's 'telephone' patent, and very likely by Bell himself. Doing my own research, I got a list of Bell's telephone patents and have been reading them. Interestingly the telephone grew out of work on multiplex telegraphs. This is what Bell was working on. It was the subject of Bell's first patent in 1875. Bell's second patent (early 1876) is now known as his 'telephone' patent and sometimes alleged to be the most financially valuable patent ever issued. However, when you read it you find that its focus too was on a method to multiplex the telegraph. The telephone section in the 'telephone' patent being little more than an add-on extension. The telephone add-on was just a conceptual scheme in a figure that showed two electromagnets with variable gaps hooked together. Cones were pointed at plates that were parts of the gaps, the idea being that if air pressure modulated the plate in the gap of one electromagnet, then it would modulated the current in the second electromagnet and move its gap plate in the same way. At the time the patent was filed (Feb 14, 1876) it seems likely (book is not clear on this point) that Bell had even tried to build it, but it's certainly true that if he had tried to build it, it wasn't working. Everson in his book, says it worked. The heart of the Telephone Gambit story is that almost immediately after Bell returns from Washington with the patent in hand, his notebooks show him trying an entirely new type of transmitter. He sketches it in his notetbook just two days after returning to Boston and the very next day (3/10/76) he succeeds in sending and receiving speech ("Watson come here"). The new type of transmitter is a variable resistance type made with a metal needle (connected to a cone) rising and falling in water. 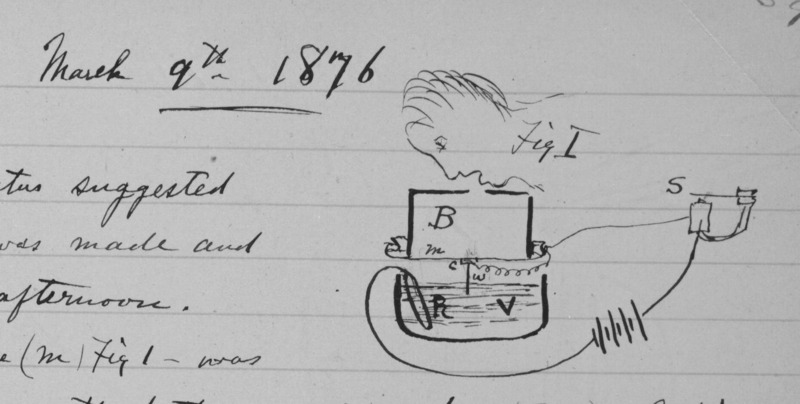 This transmitter is clearly shown in the sketch of Gray's 'caveat' that he filed with the patent office the very same day as Bell filed his patent application! Shulman is struck by the fact that the 3/9/76 sketch in Bell's notebook looks almost exactly the same as the sketch in Gray's caveat, filed 2/14/76 and supposely to be kept secret for a year by the patent office. Therein hangs the tale. Very soon (5-6 weeks) after his successful experiment with the liquid transmitter, Bell stops working on it (very telling says the Gambit author!) and goes to work on the magnetic telephone idea he sketched in his patent. And in a few months it's working. He demos it in May 25, 1876 at MIT and a month later (6/25/76) at the world's fair in Philadelephia before Lord Kelvin, Elisha Gray, and many others using his magnetic transmitter. All are very impressed, but it barely works, very faint and only some words are understandable (distance 500 feet). Also the test is somewhat rigged because Bell's speaks a well known Hamlet speech -- To be or not to be. My comment --- Bell is trying to develop a variable reluctance transmit and receive device at a time when no one really had a good understanding of the magnetics involved. In addition there's the tricky issues of what material to use as a membrane, how to tension it, and how to couple it to the magnetics while still allowing it to move freely. And he has been working on this prototype for only a month or two before his spring 1876 demos at MIT and the world's fair. OK, it barely works, but still it impresses. It's a very early prototype, which is how he introduces it at the fair. With a few months more work on his magnetic devices it works better. By Oct he is able to do a sucessful two mile bi-directional test over a dedicated telegraph line, and in Feb 1977 a paid public demo from Boston to Salem (18 miles). In Jan 1877 he files a second telephone patent on an improved telephone with metal replacing a stretched material for the membrane, a new way to couple to the magnetics, and a PM replacing the electromagnet. Also this design is much more detailed, it looks like a product. The Bell Telephone company goes into production with an electromagnetic transmitter and uses it for about two years (1877 and 1878) (Presumably this is Bell's design, but I have been unable to confirm this.) In 1878 Bell Telephone is competing with Western Electric, and starts losing customers to them because they from the start have used the better performing (louder) Edison's varible resistance carbon transmitter. In the beginning of 1879 Bell Telephone switches too to a carbon variable resistance transmitter. Unless someone at Bell Telephone (was there any other designer beside Watson?) improved his telephone design, it looks like Bell did in fact develop an electromagnetic transmitter and receiver that evolved from his March 1876 patent sketch and that worked well enough to be used by Bell Telephone commercially for two years. Bell would have done this work in during the last seven months1876, resulting in the design of his 2nd telephone patent, and possibly the first six months of 1877, after which he takes a powder (year+ honeymoon). Shulman says after he leaves on his honeymoon in mid 1877 he never really has anything to do with the Bell Telephone company again, except testifiy for them in patent cases, but I find this not to be true. Bell files half a dozen telephone patents in the next two-three years, including one from England six months into his honeymoon. Some are a little off the wall, like his six inch balloon carbon transmitter, but several are detailed exchange related engineering patents. And one ('twisted pair' patent, #220,791, Oct 1879) is a major engineering contribution to the telephone engineering (telephone signals are carried on twisted pairs to this day). These indicate (to me) that even if Bell was not 'employed' by Bell Telephone, he at least (at times) worked closely with them, because for several years he contributed patents as a (in modern terms) 'consulting engineer'. This would be similar to Gray who worked independently yet contributed patents to his former company Western Electric. For me the smoking gun that Bell lied is this --- Bell claimed he added the seven paragraph section on variable resistance transmitter (which three years later will turn out to be a critical telephone component) on Jan 12, 1876 just before mailing it to his patent lawyers. Over the next few days he makes several copies, one of which is to be filed for an English patent, personally delivering a copy to Brown on 1/25/76, who sails for England the next day. When Brown's copy is found (no reference given by Shulman !! and I cannot find it), it turns out not to include the seven paragraphs on variable resistance, which in a surviving draft (presumably in Bell's handwriting) are written in the margin. If you read it (like I have), you find the 3/76, so-called 'telephone' patent, is primarily a multiplex telegraph patent with the telephone being an extension. The telephone described is nothing more than back to back (slightly modified) morse sounders, which it is claimed can (possibly) transmit vocal sounds. The text (& related claim) written into the margin about a variable resistance transmitter, is thus an extension of an extension. It is another, and more complex way, to transmit vocal sounds. It is possible that Bell upon reflection considered the latter to be really secondary and not that important (more complex since it required a separate transmitter and receiver and less practical since it uses a liquid), so he left it out of the copy prepared for British filing. It's also possible (but unprovable ) that he had in the back of his mind doing a real, more comprehensive, telephone patent later when he got something to work. He might have just thrown in what ideas he had on the telephone into his 3/76 multiplex telegraph filing, because he was able to argue that the telephone worked in much the same way (using current 'undulations') as his multiplex telegraph. Bell was able to build and successfully test the Gray liquid variable transmitter in three days. So how come Gray didn't do it? (or did he?) Gray had a big telegraph lab. Did he not have a receiver? If it was so easy, why didn't he try it even if his patent lawyer had told him he had lost out to Bell due the earlier notary date. It would have been a fun test. Shulman (doesn't necessarily say this, but he) leaves the impression that Bell come back to Boston and having learned about the liquid transmitter the first thing he does is build one and try it. (And only three days back from Washington he has it working!) But this is not what the notebooks show. It's only on the 2nd back in the lab that he begins to work on the liquid transmitter. The first day (to be checked!!) looks much of his previous work. So if Gray didn't try, then it's fair to say that Bell invents the telephone. He conceives of a magnetic approach early, patents it, and then with a few months work perfects it enough to get customers and start the commercial telephone business. It's only after two years of commercial use, that his magnetic transmitter is replaced by an improved design. I think a more interesting question than 'Who invented the telephone', is 'How much did Bell really contribute to bringing the telephone from being a lab curiosity to a practical device, in other words how much did he contribute to telephone engineering?' A few well dated Alex Bell milestones can be placed in context with the known development of the telephone business in the USA. In March 1876 Bell first transmits understandable speech using a liquid transmitter. Not only is the liquid transmitter (probably) going to be hard to make practical, but Shulman makes a convincing case that Bell doesn't want to use it because he stole the idea from Gray and he needs (for several reasons) to keep this quiet. Also he thinks he has another way that might work, but which needs a lot of work. It's the all electromagnetic approach that he sketched briefly in his Mar 1877 (multiple telegraph) patent. If he can make it work, it has several (potential) advantages: it's his idea, it's patented, and being all electromagnetic it's likely to be more practical and easier to manufacturer than a liquid telephone. In fact in a couple of months he gets his electromagnetic approach to work, not very well, but it does work well enough to transmit speech where at least some words can be understood. In May, June 1876 he gives demos to crowds of it at MIT and the world's fair. It looks like he spends the rest of 1876 working on an improved and more practical design that can be put into production. For example he replaces the unreliable parchment membrane with a metal membrane and switches over to a PM obviating the need for batteries. The result of this six months of labor in the second half of 1876 is the combo transmitter/receiver telephone that he files for a patent on in Jan 1877. It seems likely that this is the model that went into production in early 1877 and began to be used by private customers in summer of 1877. Most or all of the engineering work on the first telephone exchange, which started up in Jan 1878, was probably done by others at Bell Telephone, since by summer of 1877 Bell is gone. He leaves for 15 months in Europe on his honeymoon, and he never returns to work for the company that bears his name. combo transmitter/receiver, described in patent 186,787 (issued 1/30/77). So how good was this phone? Well, a lot of people looked at it, and said, at least metaphorically, I can do better than this piece of crap. Edison files a patent in Aug 1877 for an improved transmitter that has a mica membrane, a notch in the acoustic path to reduce overpressure of consonants, and a carbon variable resistance microphone that puts out much more power than Bell's electromagnetic microphone. Six months later (early 1878) Western Electric starts to use Edison's microphone in their telephones and in about another year Bell Telephone switches over too after they acquire the patent rights to it in a deal with Western Electric. Here's Wikipedia's summary (in Elisha Gray and Alexander Bell telephone controversy). This is accurate and I agree with the conclusion. Although Bell was accused, and is still accused, of stealing the telephone from Gray, Bell used Gray's water transmitter design only as a proof of concept scientific experiment to prove to his own satisfaction that clear human voice sounds could be electrically transmitted. After that, Bell focused on improving the electromagnetic telephone. Because Bell's electromagnetic telephone did not use Gray's invention in public demonstrations or commercial use, Bell did not steal Gray's invention. Baker, who is a retired patent lawyer, points out in his book that a comment that Bell makes in a letter virtually proves that Bell's lawyers were slimeballs. After meeting with his lawyers (Polk and Bailey) in Washington in Mar 1875, Bell writes his parents that his lawyers 'know' he is far ahead of his rival Gray on the harmonic telegraph and consequently have broken up his telegraph filing into three application, two of which they expect will not interfere (overlap) with Gray's and one of which will. But as of March 1875 the content of Gray's two telegraph patent applications, which are sitting in the patent office, are still secret. Gray's harmonic telegraph patents, filed in Jan 1875, will not issue and become public until July 1875. This is near proof that Bell's lawyers were obtaining confidential information about Gray's patent applications and are were using it (unethically and illegally) to benefit their client Bell and his influential backer Hubbard at the expense of Elisha Gray. And its not hard to guess that their source at the patent office is inspector Wilbur, friend and debtor to Bailey, who handles all the telegraph patents, and who later in life affirmed that this is what he did. Note the fact that Bell seem OK with using information from unissued patents indicates that he is (as of Mar 1875) either very unknowledgeable about patents or else he thinks like his slimball lawyers. Bell's file copy is the version of the March 1876 (first telephone patent) now at the Library of Congress that was obtained from Bell papers and is thought to be his handwritten copy for the Feb 14, 1876 filing. A facsimile copy is included in the Baker's appendix (pA71, version F). Baker's book also includes the (recovered) Brown version, which while printed, has additions and deletions noted changes by use of caps and brackets. When Shulman (and virtually all recent telephone authors and the 1880 court cases too) talk about the (clearly later) additions to this file copy that were written vertically in the margin, they almost always just just talk about the variable resistance material. Since this material was missing from the Brown version, it's a small jump to conclude that the variable resistance material (& claim) must have been added to Bell's application either just before or (illegally) after its Feb 14, 1876 filing, after Bell's attorneys (somehow) learned about the wire in water variable resistance transmitter in Gray's (confidential) caveat, which was also filed Feb 14, 1876 and which is known to have been written in the three days prior to its filing. Nice neat story, but it' too neat. A close review of the documents shows some facts that just don't fit the story very well. changes in Bell's file copy. not the version taken to England. 3) Up and down vibrations of the plates of a battery, which vary its "power"
4) A new 4th advantage is added in the margin vertically. To me these four margin changes appear to be a general (last minute) revision not just the insertion of an item stolen from Gray. --- [Undulating current of electricity may be produced in many ways than that described, but all the methods depend for effect upon the vibration or motion of bodies capable of inductive action.]. --- There are many [other] ways of producting undulating current of electicity, but all of them depend for effect upon the vibration or motion of bodies capable of inductive action. --- There are many ways of producting undulating current of electicity, but all of them depend for effect upon the vibration or motion of bodies capable of inductive action. Bell's file copy is modified by omitting 'but all of them depend' with the word 'dependent' (This change required for consistency with variable resistance transmitters.) The modifed version makes it to the issued patent. --- There are many ways of producting undulating current of electicity, depend for effect upon the vibration or motion of bodies capable of inductive action. Bell's patent application had material added in the margin (oriented vertical) that described a liquid, variable resistance transmitter that was substantially identical to material contained in Gray's confidential caveat. Bell testified that he added the variable resistance material in Boston at the last minute before mailing it to his lawyers. A week or so later Bell wrote his fiancee that he and a copyist he had hired were busy making (handwritten) copies of it (plus several other applications): one for the patent office, one for Brown (to use for an English filing), and one for himself. Yet a few years later, when the Brown version showed up as evidence in a court case, it was found to be missing the variable resistance text and claim. 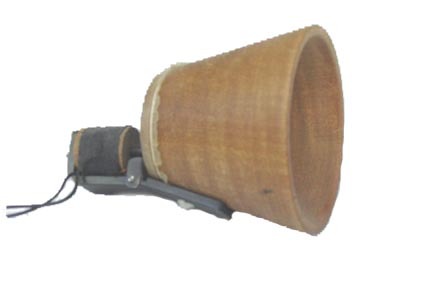 Is this not a 'smoking gun' that Bell lied, greatly strengthening the case that the variable resistance material was obtained from Gray's caveat and later interpolated into Bell's patent? Certainly the attackers in the 1880's court cases thought so, and so do nearly all the modern books on the telephone patent fraud. After reading Shulman's book, I thought so too. The Brown version missing the variable resistance material certainly seemed to be the smoking gun that Bell's application, when it was sworn to, could not have contained the variable resistance material. But now I'm not so sure. When you look closely at the Brown version and the known circumstances about it, things don't add up. * The differences between the Brown version and published patent is not just the missing the variable resistance material. In the harmonic telegraph section Brown version lists four advantages, the final patent contains five. The Brown version is full of crossed out text and small wording differences. The Brown version is clearly, without question, an earlier draft of Bell's patent application. * In days when travel mean taking the train Bell travels from Boston and xxxx comes up from Washington to meet with Brown in New York a day or two before he sails for England to discuss the English filing for a patent and Brown financial stake in this enterprise. To me it's (almost) inconceivable that after traveling to New York just for this meeting that the patent application they give Brown, the one that will be used for an English patent filing, would be an earlier draft with stuff missing. And Brown isn't going to ask, 'This is the final version, right, the same as is being filed in Washington?' Even if they skimped on the copying and it was an earlier draft, why at dinner would not Bell update it by adding in the missing stuff? After all, we know he wasn't opposed to writing in the margin! * There has been an earlier meeting with Brown in Canada (Brown's Canadian and Bell spent time at his parents house in Canada) about De 29, 1875 to establish the business relationship with Brown (he agreed to pay Bell a monthly fee to support his work for some patent rights). Bell testified that he had been drafting his patent application for months before its Feb 14 filing. So isn't it likely (very likely) that around the time when the business relationship with Brown was established (end of 1875) that Bell gave Brown a copy of the application as it then stood, or maybe even an outdated version? After all the (potential) patent is what Brown was 'buying' from Bell. * What is now called the 'Brown version' was only gotten back from Brown (by Watson) in Canada two years after he sailed to England. With all the principals traveling to NYC to meet with Brown before he sailed, I argue he must at that time been given an application that if not clean was at least was up to date, consistent with what Bell wrote in his letter to Mabel. I also argue that because Brown's business relationship with the potential patent had formed a month or so earlier it's not unreasonable that Brown had been given a draft of the application at that time. Two years later when he is asked to produce the Bell application for the court he produces the earlier rather than the later version. Who knows, maybe Brown didn't know the two versions were different. Maybe the version he took to England (to be rewitten for an English filing) he never got back or brought back. Maybe when he looked into his files this is all he had. Who knows? If this is the case, then the fact that the recovered Brown version is missing the variable resistance tranmitter section is off the table, it tells us nothing about when the variable resistance material was entered into the appplication. In a deposition taken 16 years later Bell said the variable resistance material was not included in the copy Brown took to England by "by some oversight" and "by some accident the matter was overlooked". This is not an explanation. It is a best a lame excuse. Baker calls it incredible. How could no one notice that Brown's copy had one less claim that clean copy awaiting US filing? When the Brown verson is discussed, the discussion is virtually always limited to the 'famous' missing seven lines. This is the only text in the patent that discussing variable resistance and which in the handwritten Bell file copy were written vertically in the margin. But a much more detailed comparision can be made using the reference material in the appendix of Baker's book. Both versions have additions and deletions, so it's useful not only to compare the baseline documents, but look in detail at the whats added and deleted. There are enough changes that we may be able to figure out how to order the doucments. Baker in his book (p117) says Bell's file copy in its original handwritten form "conformed almost exactly" to the version given to Brown for filing in England (really the Brown version recovered two years later). I don't agree. I see evidence that the Brown version is an earlier draft. * Bell's file copy had two large insertions written vertically on different pages in the margin. One, of course, is the famous section that includes variable resistance and wire in a liquid. The other is fifth advantage of undulating currents. But not just the variable resistance text is missing in Brown, the fifth advantage of undulating current is missing too. This is significant, because the argument that Bells patent is changed after filing (while Bell is in Boston) with material learned from Gray's caveat on variable resistance, must now also include and unrelated change, the addition of a fifth advantage for undulating currents. Baker's book talks about the court record showing that small changes were allowed in Bell's application on Feb 29, 1876, which is about two weeks after it was filed. Very strange. However, I have not seen anywhere what the Feb 29 changes were. I suppose it's possible that the addition of a fifth advantage (mentioned above), which was missing from Brown copy, might have been one of the Feb 29 changes. To me an engineer it's could very well be that the variable resistance material was added to his application, just as he testified, at the last minute before he mailed his application to his lawyers. He's written up what he has done in the lab, but in a patent you try to be as broad as possible to cover all bases. His patent focues on what he calls 'undulating current', meaning currents that vary continuously as opposed to on/off as in a normal telegraph. He asks himself is there any other way to get current to continuously vary. Sure there is. Just connect a battery to a resistor and a current flows determined by one of the simplest rules in electronics, ohms law (i = V/R). So (I am supposing he realizes) that another way to cause "undulation" in the current is smooth continuous variation in either the battery voltage or the resistance. "This is an excellent book. I bought it hoping it would give me (a retired electrical engineer with more than a dozen patents) some understanding of the telephone's genesis, which I knew to be a complicated tale with claims that Bell didn't deserve the credit. Frankly I was hoping for a good story and Shulman delivers. He lays out the twists and turns of this story in a remarkably clear narrative, but this is not just another retelling of the telephone story. Shulman started working on this book only because he made a startling discovery in Bell's lab notebooks. He found that Bell's sketch of his first (functioning) telephone transmitter was nearly identical to a sketch drawn by Elisha Gray in his (supposedly) secret filing with patent office a month earlier. And even more suspiciously Bell had drawn the sketch in his notebook just days after returning from Washington where he had conferred with his patent lawyers and the patent examiner. Shulman has researched in depth if, how, who, and why fraud was committed in the patenting of the telephone, with close attention to how things were later explained in court depositions and testimony. The picture Shulman draws is very convincing that major hanky panky (fraud) occurred in Bell's patenting of the telephone. Shulman lays out the case that Bell had a strong motive (love first, money second) to go along with the fraud, even though he many not have initiated it, and as Shulman argues, his shame and need to conceal his use of Gray's idea nicely explains many of his later actions that have always been puzzling. It all hangs together very well. The case for patent fraud is overwhelming, and Shulman draws the appropriate conclusions. So is Bell essentially just a crook who stole Gray's design and deserves no credit? Well it's easy to jump to this conclusion after reading this book, but there's another side to this story. For starters read the Wikipedia article: 'Elisha Gray and Alexander Bell Telephone Controversy'. It explains, based on facts fully consistent with Shulman's book, why (in their opinion) Bell did not steal Gray's invention. My opinion, after reading Bell's patents, researching the design of the first US telephones, and doing some reading of Bell's notebooks (available online from the Library of Congress) is that while it appears that Bell stole Gray's idea in the legal sense (via patent fraud), he didn't steal it in the engineering sense. The undisputed fact is that Bell and his partners started the telephone business in the US with a Bell designed electromagnetic telephone. By modern standards it was primitive (weak, distorted, and only good for 10-20 miles or so), and it lasted in the marketplace less than two years before being replaced by a telephone much closer to modern phones with a variable resistance carbon transmitter. On the other hand the Bell design was simple (it was a combo receiver/transmitter), easy to manufacture, and most importantly it worked well enough so that thousands of people put down their money to buy or rent one. Note Bell's electromagnetic telephone design was indisputably his own design. It had nothing to do with the famous seven (disputed) paragraphs written in the patent margin, which described the concept of a variable resistance transmitter. The variable resistance transmitter required another year of development work (by Edison, Blake and others) and was not introduced into the market (by Western Electric) until about a year after Bell's phone business began. So did Bell 'invent the telephone? The early phone (and associated telephone exchanges) were the work of Bell, Edison, Blake, and others, but Bell by using a simple, low performance design of his own was able to get to market a year ahead of his competitors and get the US telephone business off the ground. So if there is to be a 'single' inventor, Bell (by virtue of his being first) is the inventor of the telephone." Edwin Grosvenor added a comment (below) to my Amazon review on 11/25/14. The name Edwin Grosvenor sounded familar and a little research showed he is the Editor-in-Chief of American Heritage magazine and the author of an 1997 book an Alexander Graham Bell. "You might want to look at the Wikipedia essay on the Bell-Gray controversy again -- a lot has been added. Bell's drawings are consistent over a span of three years, long before Gray submitted his, and there was a similar liquid transmitter in Bell's patent for a fax machine which was granted by the PTO the year before. Shulman didn't really know much about the history of the telephone, and has done a real disservice." A rereading of my 2008 essay shows that I too found at the time a lot Shulman's judgements to be questionable. What started Shulman on his telephone research was his recognition that Bell's sketch of his first operating telephone transmitter in his notebook looked so much like the sketch in Gray's caveat, and he has a figure in his book showing both together (see timeline below). However, in reading more books about the telephone and doing some research online other versions of Gray's transmitter are available. It appears that the sketch in the caveat, which is what Shulman shows, was not Gray's original, but was probably redrawn by a draftsman in his patent lawyers' office in patent style. The similarity of Gray's original sketch to Bell's notebook sketch is even more striking. The dating is consistent with the history that Gray wrote out the caveat (in Washington) just a few days before it's filing. It's not hard to believe that the caveat figure (see below) could have been drawn from this sketch (by a draftsman employed by the patent firm) because the essential features are the same. Also there is confirming evidence in the many minor (or from an engineering point of view unimportant) details that are the same, for example, the shape of the receiver sound chamber, the rim flare on the liquid beaker, the location of the liquid beaker terminal centered below it, and the label 'Line' on the wire between the transmitter and receiver. Compare this to a close up of Bell's notebook sketch that I captured from the official archives. Bell claims (under oath) he has not seen Gray's caveat (or Gray's original sketch? ), but notice the similarities. Of course not all these similarities are independent or too important. For example, with a liquid transmitter, it's going to be necessary to bend over to speak into it. Once the transmitter is put on the left and the receiver on the right (with the line between them), the most natural location for the transmitter terminal is on the right of the liquid container (and at its bottom). The circuit would work with the battery anywhere in the series path, but its most natural location is in the ground path of the transmitter (rather than in series with the line), and this is where both sketches have it (Bell's is a little ambiguous). Below is another sketch of Gray's design. I screen captured this from Bruce's 1990 book on Bell (as displayed on Amazon). Bruce labels it 'Diagram for Elisa Gray's caveat'. Where did this come from? I doubt this was drawn by Gray because clearly more effort was put into drawing the men than the apparatus. It just doesn't look like an engineering or patent sketch. It's out of balance and too artistic. My guess is that it was redrawn by an artist for some publication. Here's a more realistic drawing of Gray design, which I found online. Is this a redraw (in patent style) of Gray's dated 2/11/1876 original by a draftsman on Gray's legal team? Note it is drawn reversed (speaker now on right) from Gray's 2/11/1876 sketch. In spite of the near certainty of patent fraud it's undisputed (I think) that the first US commercial telephones (exclusively in 1877 and in competition with Western Electric in 1878) used a simple electromagnetic design of Bell's. It was clearly his design, totally different from Gray's. It had been sketched (but not yet reduced to practice) in his famous telephone patent draft notarized in Jan 1876, the sketch is in all drafts of Bell's patent including the Brown version. Note Bell's electromagnetic telephone design has nothing to do with the famous seven (disputed) paragraphs written in the margin. The seven paragraphs were about the next step in telephone transmitter design, the variable resistance transmitter, which Western Electric began using in early 1878 and Bell Telephone switched to in early 1879. The case laid out in the book is so strong that it's tempting to just conclude that Bell was a crook and doesn't deserve any credit. Unfortunately Shulman almost temps you to so conclude by stopping the story a tad too early. By not discussing the design of the first commercial US telephones, he leaves out information crucial to evaluating Bell's contribution, information which puts Bell in a better light. Wow! No wonder these notebooks are so neat, they are'nt real (contemporaneous) lab notebooks these are cleaned up copies of lab notes. Page 7 is signed "Copied Feb 21, 1876" and the purports to describe experiments run six to nine months earlier (June to Oct 1875). The timing is interesting. This cleaned up notebook is prepared in the 10 days between the filing of Bell's telephone patent (& interference with Gray discovered) and the time he leaves for Washington. Bell's lab notebooks are available online from the Library of Congress. They are quite readable as Bell's handwriting is very good, and there were grayscale scanned at 300 dpi. They are almost too readable. Why are the sketches so formal? Everything is labeled patent style. Next to the battery symbol he sometimes writes "battery". Clearly Bell is not just writing for himself. I assume the formality and detail is because this is what the patent lawyers wanted if they had to establish "first to invent". The irony is that even though the telephone patent was perhaps the most litigated patent in history these notebooks were never offered up and their content never disclosed to anyone (according to Shulman). 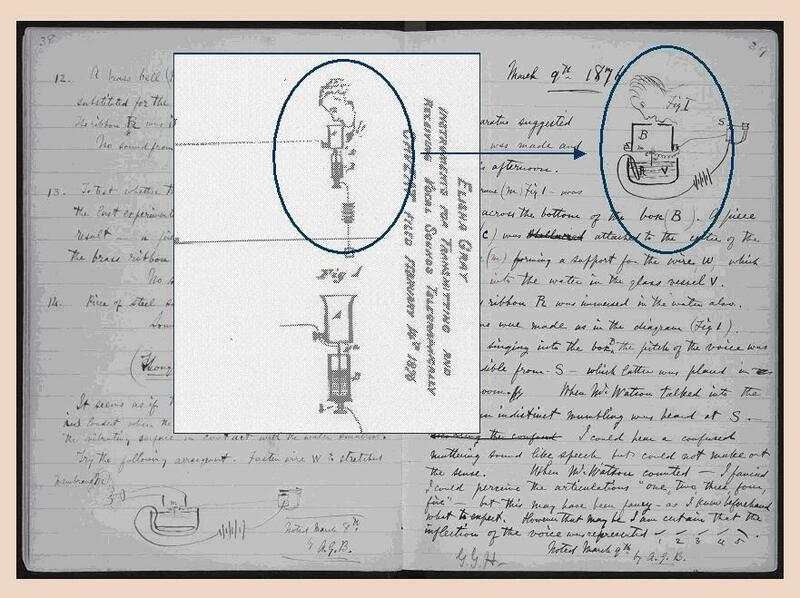 The "first to invent" in Bell vs Gray was decided on the basis of notary dates of their respective patent filings. Bell worked in the lab on his multiplex telegraph & telephone for no more than two and half years: 1875, 1876 and first half of 1877, when he got married and essentially retired from telephone work. Link below is for notebook Oct 1875 to April 1876. This covers the three months before he filed his 'telephone' patent and includes the first famous 'phone call' of Mar 10, 1876. Page 19 he returns from Washington (3/7/76), page 21 has sketch of the man talking into a liquid transmitter (3/9/76) that Shulman noticed was almost the same as the sketch in Gray's caveat, page 22 has "Watson come here", the first time he transmits and receives understandable speech (3/10/76). Most of the discussion of early telephone design talks about the transmitter, but it appears to me that the receiver needed a lot of work too. 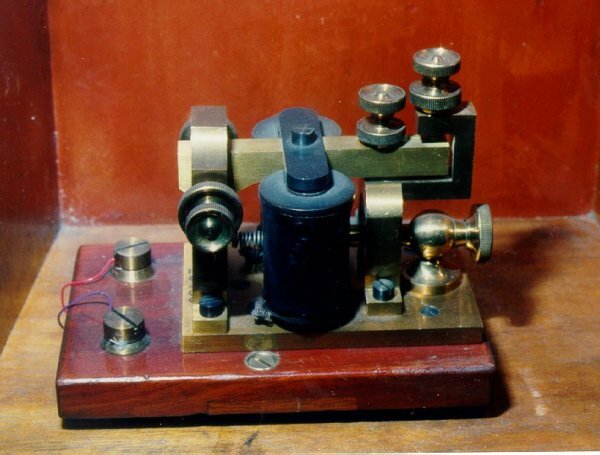 An electromagnetic (coil, movable gap) structure can in fact work as both a transmitter and receiver, and one of Bell's early telephones worked this way. 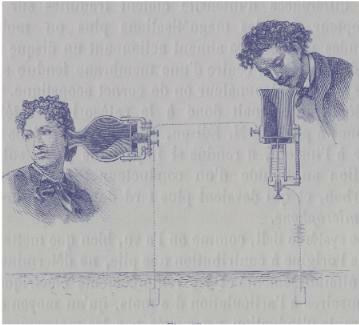 In Bell summer 1876 World's fair demo, equipment that just barely works, his receiver is not the same as his transmitter even though the transmitter is electromagnetic. The receiver looks very crude. The movable plate looks to be just lying on the magnet (he need to get a very small gap) and apparently you put your ear right on the plate. In his lab notebooks Bell shows that his 'receiver', i.e. where the sound comes out, is almost always shown (& labeled) as a Morse sounder. He usually sketches it as coil wound around a square metal loop with a pivoted piece on the top. It looks a lot like a standard sounder except he doesn't show any stops making the movable piece free to move (a little) up and down. He may have had a couple of different types. Sometimes when he is trying to detect musical tones (from a tuning fork), he says he puts the movable piece of the sounder directly against his ear. But when trying to listen for speech he uses sounder where the movable piece in the electromagnetic flux path is a metal membrane that can vibrate, and coupled to the membrane is a tube that focuses the sound to the ear. He has quite a detailed, pencil drawn sketch of his membrane sounder in his notebook. A standard Morse sounder is shown below. It had became the standard telegraph 'receiver' (clicker) around 1850. The vertical cylinders are the electromagnet coil(s), which are wired to the telegraph line. There is a gap in the magnetic flux path of the electromagnets connected to a pivoting horizontal rod. When the electromagnet is driven by current from the telegraph line, it pulls down on the pivoted rod narrowing the gap. It looks all metallic, so a current pulse probably made a double click, one at start (down) and one at stop (up), but it wouldn't be hard with a little felt pad to muffle one of the clicks. Membrane --- you need a material that moves with high amplitude on low pressure, can be tensioned, and will hold tension (impervious to temp, moisture, time). There are also issues with its self resonance. Parchment may suffice by a quick test, but it's not going to work for a commercial phone. Edison says animal products like hides are also not reliable, so he chooses mica. How to couple the membrane to the variable resistance material, or in the case of the electromagnetic transmitter to vary the reluctance. This is tricky. The moving membrane needs to maintain contact with the 'read out' material, but it must still be free to easily move. Is the 'read out' variable resistance or variable reluctance. In variable resistance there can be power gain, meaning there is more power in the electrical signals that was picked up from the sound wave with the extra power coming from a local battery. This might also be true too in a well designed variable reluctance structure using an electromagnetic powered by a battery. Bell in his commercial phones replaced the electromagnet with a PM (permanent magnet). With a PM there is no external source of power, so all the electrical power must come from power picked up from the vocal input. No gain. However, this was (apparently) good enough for at least a few miles. I have yet to find out how far spread out were the customers of the first New Haven switchboard. Bell and Watson in early 1877 publicly demonstrated fairly reliable comprehension was possible at a distance of 18 miles, but I have yet to see what type of equipment they used for this test.. Early telephones worked much better with vocal sounds than consonants (Bell, Edison, and newspaper accounts all note this). Edison says this is because consonants were overpressuring the transmitter membrane. He introduces a notch or opening in his acoustic path which he says helps a lot. Too resonant a membrane gave voice a ringy character. Edison liked mica over metal, because he said it is layered and thus non-resonant (meaning well damped). 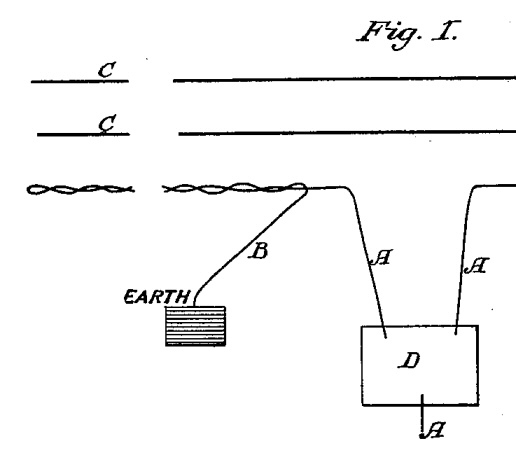 However the 'telephone' patent does include a sketch (fig 7, below) of two electromagnetic transmitter/receivers connected back to back, which is essentially what Bell first introduces to the market. More important legally its claims include producing undulations (in current) by "increasing or diminishing the resistance of the circuit", which is what the carbon microphone will eventually do (claim 4). And claim 5 includes "method of, and apparatus for (fig 7), transmitting vocal or other sounds telegraphically". is then heard to proceed from (cone) L"
Bell's first patent (161,739) filed about a year earlier (April 6, 1875) was a a totally impractical multiplex telegraph that is really a crude fax machine. It required messages written in ink on metal to be 'scanned' by being pulled under a matrix of close wires with paper similarly being pulled under a matrix of receivers for an inked image to be written. At this time Hubbard is already one of his backer (one of the assignees). The impracticality of this 'fax' patent must have been obvious to Hubbard. 1/12/76 Bell finishes up handwritten draft of patent and mails it to his Washington patent lawyers. The transmitter uses a stretched material for a membrane (This type of membrane, says Edison, is unreliable, because it loses tension when it absorbs moisture from breath.) The membrane couples to an electromagnet that pushes on it. This draft, which is preserved in the national archives, shows that what later turns out out to be a key section (seven paragraphs on variable resistance transmitter, such as a metal rod projecting into a liquid, and presumably the related 4th claim), is clearly a last minute addition, because it was written in the margin. Bell testifies he added it just before he mailed it on Jan 12, 1876, but much evidence says it may very well have been added (by someone) after Gray's caveat was filed Feb 14, 1876. If this is true, then Bell was a lying sonofabitch. 1/20/76 Bell signs and has notarized a clean copy (presumably with drawn figures) that he has received back from his patent lawyers. A key point is that Brown's version of the patent application does not contain the seven paragraphs (on the liquid variable resistance transmitter) that Bell supposedly added to the application 1/12/76. Based on this it appears very, very likely that Bell lied (under oath) when he said the seven paragraphs were added 1/12/76. 2/14/76 Bell's patent is filed (by his lawyers against his instructions!) and the same day Elisha Gray's telephone patent is filed (by him?). Gray's caveat is notarized also on this day (2/14/76), whereas Bell's was notarized three weeks earlier (1/20/76). This difference in notary date is crucial, because who invented first is what counted to the patent office at this time. So if text about a variable resistance transmitter was in fact illegally slipped into Bells' patent application after its notary date (1/20/76), then it gets an earlier invention date than Gray's. This turns out to be crucial in several ways. One, since it created an overlap, an interference in patent office jargon, between Bell's and Gray's filing, even if Bell didn't see Gray's caveat, he may have gotten a strong hint from the patent examiner as to what was in Gray's caveat, because Bell said the patent examiner pointed at the seven paragraphs and said the interference was here. 2/24/76 Bell's interrupts his experiments and travels to Washington (on patent business). Why exactly does he go to Washington? Don't think Shulman addresses this, but presumably the patent interference has been discovered and he needs to talk over what to do with his patent lawyers and (future) father in law, investor, and big time Washington insider lawyer, Hubbard. 6/76 Bell in Washington and discusses his patent with the patent examiner. The examiner it turns out is a friend, and even owes money to, one of Bell's patent lawyers. The examiner is a drunk too, and ten years later signs an affidavit that says he showed Gray' caveat to Bell at this time! Gray also tells the story that he ran into the patent examiner (Wilber) on the streets of NY years before the affidavit and the examiner told Gray that he was the inventor of the telephone. 3/7/76 Bell arrives back in Boston from Washington. On the same day (three weeks after filing) his patent is issues as #174,465. Patent is issued only three weeks after it is filed, Shulman who looked into this say this is not usual, but I find most of Bell's patents were issued within a month of filing. 3/9/76 Bell draws a water type transmitter in his lab notebooks with a man's face talking into it. This is only two days after he gets back from Washington, and there is a very strong similarity between Bell's notebook sketch and the sketch in Gray's caveat. Shulman, who has studied Bell's lab notebooks, says nothing like this liquid transmitter (and a face) has ever appeared in them before this date. Shulman was the first to notice the simularity of Bell's sketch to Gray's, and it's what set him off digging into Bell's telephone work. These two sketches are the genesis of Shulman's book. Shulman is certainly right about the similarity. It is striking. The same rectangular voice box, and even the angle of the head is almost the same. (Shulman notes that nowhere before in his notebooks has Bell drawn a head.) But it's even more interesting when you look at Gray's original sketch, see section 'Bell's & Gray's 's variable resistance transmitter sketches' (above). 3/10/76 Bell on this day is the first to operate a working telephone. It uses the water variable resistance transmitter he sketched the day before. Years later Watson, Bell's lab assistant, will write in his autobiography that the first use of the phone had been when Bell called him from the next room, saying "Watson come here, I want you". Historians like a pithy story, so they adopted it making it famous. Key and undisputed fact --- Bell demonstrates a working telephone only after his patent is granted and only three days after he returns from Washington. It uses a brand new (to him) transmitter design that is not the transmitter he sketched in his patent but is just like the transmitter sketched by Gray in his 2/14/76 caveat filing. (end of April to early May) Bell's notebooks indicate that he stops work with the water variable resistance transmitter, and he begins working only on the electromagnetic concept that he had included in his patent. 5/22/76 Bell gives a talk at American Academy of Arts and Sciences (in Boston) about his phone and does a demo, but only music is transmited (how?) and played over the receiver for the audience. Shulman says he mentioned the liquid transmitter briefly, but focuses on the electromagnetic transmitter. Date could be 5/10/76, both dates appear in Shulman's book. Note he is using equipment he must have thrown together very quickly, probably within a month or two. 5/25/76 Bell gives a demo of speech transmission at MIT before a crowd. 6/25/76 Big time demo at 1876 World's Fair in Philadelphia. Bell demos speech transmission (distance 500 feet) and also demos his duplex telegraph. Many famous experts are here including Lord Kelvin, who is a judge, and Gray, who sees Bell's demo. The early prototype telephone demoed at the world's fair barely worked. Bell rigged the demo by giving a famous Hamlet speech, but even knowing what was coming only some phases could be made out. Still Kelvin and others were amazed at hearing speech over a telegraph. Shulman argues that Bell used the electromagnetic transmitter here, though he had the (probably) better performing liquid transmitter with him, because it was important to Bell that he convince Gray that he had invented the telephone independently (and first). In this he succeeded, though a few years later Gray later become convinced that Bell had deceived him and stolen his transmitter design. Gray at the world's fair demonstrates an octoplex telegraph, four message both ways simultaneously vs Bell's duplex (two message) demo. 8/3/76 and 8/10/76 Wikipedia has first 'long distance' calls by Bell, 4 miles and 10 miles. From his home in Brantford Ontario to a local telegraph station over a wire strung up along the telegraph wire. Distance 4 miles. Later Brantford to Paris Ontario. Distance: ten miles. From Wikipedia's description of the equipment it seems very similar, or the same(? ), as the June World's fair equipment. (end of 1876) Hubbert offers to sell Bell's telephone technology to Western Electric (telegraph people) for $100,000. Answer no. Western Electric's 'no' was considered by later business students to be one of the worst business decisions of all time. Western Electric soon (early 1878) goes into the telephone business in competition with Bell using patents from Gray, Edison, and others. But they are shut down (79 to 80) when they lose the Dowd patent infringement case. 1/15/77 Bell's files his 2nd telephone patent (his 5th patent, the other three are all telegraph patents). This is a product type patent with only (as I read it) sketchy info about the magnetic design, except that it does have a metal membrane and PM. Even in this patent the first use is telegraphic and the second usage is telephonic. It looks like this could be a patent for equipment that they hoped to sell. In fact it looks a lot like the telephone (on Wikipedia) that shows Bell speaking into it dated 1876. This is a single device used as both transmitter and receiver, unlike the June 76 World's fair equipment which used separate devices. Patent issues in two weeks (#186,787) on 1/30/77. 2/23/77 Bell does a speech demo for a paying crowd with improved equipment that uses (??) the electromagnetic transmitter from Boston to Salem. Distance 18 miles. 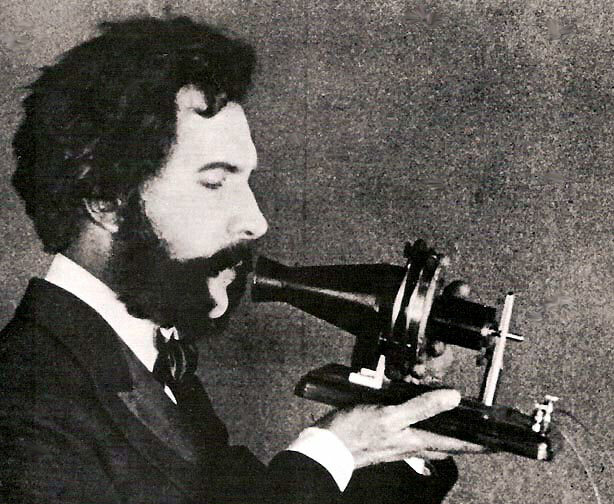 (Summer 1877) AT&T history says that by summer of 1877 the telephone "had become a business". The implications of "had become a business" is probably that Bell's Jan 1877 patented telephone (or a modified version of it) was practical enough for general use and Bell Telephone had begun to manufacture them in the first half of 1877. In 1877 the telephone is used by customers only over dedicated lines, meaning you can't call anyone, except the person on the other end of your line. For example, a factory owner or doctor might run wires from his office to his home and buy the phones from Bell. July 1877 Bell gets married and takes off on a 15 month honeymoon to Europe. So any further improvement of the telephone appear to the work of others, very likely engineers of Bell telephone. Well, my patent research says this may not be true. Bell files several practical telephone patents in the following two to three years, including one while on his honeymoon, and a very important patent #220,791 (issued Oct 1879) showing use of 'twisted pairs' for telephone lines. Twisted pair wiring is so effective at removing interference (& it has other advantages too) that to this day this is how telephones wiring is done. 8/28/77 Edison files a patent (patent #203,015) for a variable resistance type transmitter that uses compressible carbon fibers, which will soon become the standard telephone transmitter. Edison in his Aug 1877 patent on the carbon resistance transmitter for the telephone notes, as did Bell, that consonants are a problem. He explains the problem is that they overpressuring the membrane, and he introduces a notch in his speech cone which he says substantially solves the problem. Edison choses mica for his membrane claiming it has lots of advantages over materials previously used for membranes: it's not resonant, it doesn't stretch, it's impervious to the heat and moisture of breath, and it's very sensitive. This reference discusses Edison's work on the telephone in 77 & 78 in some detail. It says Edison made 150 telephone sketches Jan to Aug 1877. And importantly that Edison continued working on the telephone after his Aug 1877 patent filing (into 1878) and changed over from plumbago to a carbon button. Oct 11, 1877 Thomas A. Watson, formerly Bell's assistant, files a patent application to add a call bell to the telephone. Watson is now a telephone engineer and inventor. In this patent (#202,495) he says specifically that he is adding a call bell to the "magneto-electric" telephone Bell patented in Jan 1877. The sketch looks remarkably like a modern telephone call bel,l and it is rung with high voltage applied to the line. Dec 1877 Western Electric forms a telephone company (American Speaking Telephone Company) using the patents of Gray, Edison and others. Jan 1878 First Bell telephone 'exchange' starts operation in New Haven Conn. This apparently is a central system, hence 'exchange', as opposed to dedicated private lines. First published New Haven telephone directory, about a month after exchange starts in business, shows about 50 customers. Feb 9, 1878 Telephone product improvement patent (#201,488) filed by Bell. It's an improved magnetic structure (shaped "tubular" PM with the coil wound inside). Shulman in hia book gave the distinct impression that Bell stopped work on the telephone when left on his honeymoon in July (or Aug) of 1977. But this patent, which looks like it may be a real improvment in the magnetic design of his combo receiver/transmitter ("telephone can be lifted to the mouth or ear, as required") was filed by Bell from England about six months into his honeymoon. April 1878 Western Electric sucessfully tests Edison's improved carbon transmitter. Edison's new carbon button, variable resistance telephone is tested on a 90 mile line (New York and Philadelphia), and it tests out well with even whispers loud and distinct. It was this 'carbon button' design that Western Electric bought the rights to and started using in their phones. (thru summer 1878) Watson tries to develop variable resistance transmitter that doesn't infringe on Edison carbon transmitter patent, but has no success. Sept 12, 1878 Dowd case begins. Bell Telephone files suit against (effectively) Western Electric claiming patent infringement. (Late 1878) Bell telephone is losing business to rival Western Electric because Western Electric telephones use the "much louder" Edison carbon transmitter. (Early months of 1879) Bell Telephone is near bankruptcy. Wikipedia says Bell Telephone is now 'desperate' to get a transmitter to equal Edison's carbon transmitter, and only Francis Blake's invention of a carbon transmitter similar to Edison's saves the Bell company from extinction. Details on Blake's transmitter here. According to this reference Blakes transmitter was widely used in US and throughout the world for 20 years. This reference also has this interesting little tidbit: 'Later introduction of a battery boosted Bell Telephone's electromagnetic transmitter performance a bit'. This probably means the PM was changed to electromagnet, because then (I suspect) it was possible to design a variable reluctance electromagnetic transmitter to get some gain from a battery in much the same way as a variable resistance transmitter does. The implication of this is that if Bell himself did not do this work (there is no patent), then Bell's design may not have been used until the switchover to Blake's carbon transmitter. (early 1879) Bell telephone begins using Blake's carbon transmitter. 7/17/79 Bell files a patent (#220,791) on using a "twisted pair" of wires to run telephone signals to avoid interference from current in adjacent wires. At the time the motivation was to avoid crosstalk between circuits, but later it would prove effective in preventing pickup of 60 hz hum from AC power wires. This is important, because it turned out to be a key step in telephone engineering, and thus of great practical use. Telephone signals to this day are run on twisted pairs of wires. I don't know how much was known of twisted pairs in those day, but from reading the patent it appears that Bell may have been the first to 'discover' how immune twisted pairs are to outside interference. 11/10/79 Western Electric makes a deal with Bell Telephone to give up the telephone business, sell their exchanges to Bell, and assign all their telephone patents to Bell. Western Electric settles because they are sure they are going to lose the (Dowd) patent case. Bell is inclined to settle because it gets the rights to Edison's transmitter and an end of Western Electric's countersuit against Bell claiming infringement. Western Electric gets money (20% of telephone rentals for next 17 years). 12/26/79 Bell files a patent (#250,704) for putting two "sound-conveying tubes" on a phone, one to hold to the ear and one to speak into. This is a curious patent to file at the end of 1879. Bell Telephone had switched over to using a separate transmitter (carbon variable resistance) and receiver almost a year earlier (beginning of 79). This applies only to combo receiver/transmitter type phones, like Bell's electromagnetic, and is pretty trivial at that. Did Bell still have hopes for the combo type telephone, or does this indicate that at this time he was an outside inventor and not really up on telephone engineering? 1/2/80 Bell files a patent (#228,507) (assigned to National Bell Telephone) on a very sensitive, variable resistance transmitter that has high resistance. Curiously this telephone transmitter is a 6 inch toy balloon covered with a carbon film material (plumbago). Bell notes that the high resistance of this transmitter is an advantage because it would eliminate the need for a (troublesome) local battery and step up coil in each phone. 3/13-16/80 Bell files two telephone patents (#238,833 & #230,168 ) three days apart, the first for a call bell and the second a shorting relay. These are both are both very practical looking switchboard related patents. The first a complex bell design and line wiring to allow the central office to ring just one phone on the line. The shorting relay is to force customers to call the central office only by using the recommended push button (not taking the phone off the hook). These two patents indicate to me that Bell in early 1880 is closely connected to the engineering of the telephone network and is making real contributions. 8/28/80 Bell files his 'photophone' patent. This is (apparently) an attempt to send signals using light waves. This is one of a series of Bell patents (with co-inventors). I didn't read it, but Bruce's Bell book says the idea was to insert selenium into a battery, then hitting it with vocally encoded light causes the battery voltage to vary. Since Bell has not worked at Bell telephone since summer of 1877, this apparently is just an off the wall idea he had, unrelated to the practical engineering problems of developing the telephone system. Write a little on Difficulty of designing a variable reluctance transmitter/receiver, as Bell was attempting to do, when so little was understood about magnetic design. Shulman thinks the power comes only from the sound waves. I'm not sure if this is right. Though it must be right if PM are used, and Bell did go over to PM's. But can you get gain if an electromagnet is used? ?